Today is the final day of the Write 31 Days blogging challenge. In previous posts we talked about ways to save money and time by stocking our pantries, using coupons, buying in bulk, and stocking up during sales (especially meats), so we are wrapping up the series with a look at vacuum sealing. One of the best ways to preserve your valuable meat is to freeze it. However, one enemy of food is air, and food that is exposed to air can suffer freezer burn, mold, staleness and rancidity. When you freeze your meat the way it is packaged for sale, you could lose some of it to freezer burn. Now this food is still safe to eat, but the taste and texture may be compromised. How can you avoid freezer burn? A quick and easy way to reduce freezer burn in the short term (a couple weeks) is to rewrap it in several layers of plastic wrap or foil and place in a zip top freezer bag. However for longer storage or larger quantities of meat, chicken, pork, etc. you should consider vacuum sealing. There are a number of different types of vacuum sealers on the market, the most well-known is probably the Food Saver brand. I have the Game Saver Deluxe model which comes with the vacuum tubing to seal food in mason jars (with the jar sealer attachment). 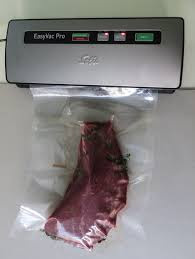 When you package your meat for sealing, you should freeze any wet/juicy foods first, then place them into vacuum seal bags, allowing for 3 inches beyond the food level for proper sealing. Many foods can be sealed and frozen, but remember that vacuum sealing is not a substitute for refrigeration or freezing and all perishable foods must be refrigerated or frozen after sealing. Vacuum sealing is excellent for foods such as steaks, seafood, chicken, pork, breads, sausages, casseroles, and hard cheeses. Freeze soft foods like casseroles and soups before sealing. They may not seal properly or you may get liquids into your sealer. Saves time because you make fewer trips to the store to purchase fresh meats. Saves money because you can buy larger amounts of meat on sale. Your meat lasts longer in your freezer. There is less waste from spoiled meat. Savings not limited to just meats; seal other foods as well. What else can I seal? Vacuuming sealing is not just for food. You can seal things like extra clothes, keys, phone, wallet, books, first aid kits, etc. for outdoor activities, beach or camping trips. You can also seal your silver to keep it shiny and reduce or eliminate the need to polish. Make sure you wrap your silver in cloth or a thick paper to prevent punctures to your bag. If you have a vacuum sealer, what do you seal most often? Do you find it saves money?